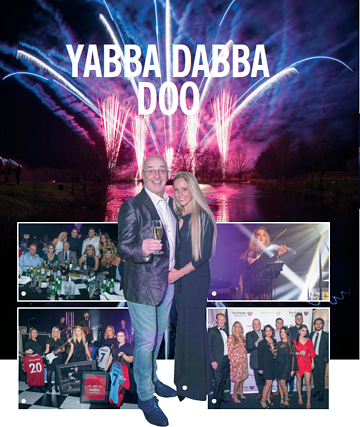 The Fifth Annual Yabba Dabba Doo charity event raises a fantastic £40,000 for youth cancer research at The Christie's Cancer Hospital in Manchester. ‘Tis the season for giving!' The Yabba Dabba Doo, an annual Autumn charity event hosted by co-founder and CEO of The DDC Group, Jan Trevalyan, was held on Saturday the eleventh of November on the grounds of Mr. Trevalyan & his partner Lisa Marriott's picturesque country home in Lathom, West Lancashire. The evening was a grand success - raising a staggering 40,000 towards cutting edge research in Interventional Radiology for the treatment of childhood cancer. The Christie’s 3D Intervention System provides minimally invasive ‘pinhole’ procedures using image guidance technology to deliver targeted cancer treatment, as well as to relieve the effects of cancer on other parts of the body - such as life threatening blood clots or blockages to major organs. The life saving benefits from this research is monumental. The evening was one full of many laughs and heartfelt tears as Mr. Trevalyan gave a moving speech that touched the hearts of many who have lost loved ones or have personally suffered from cancer. The evening’s first class entertainment included an electric violin duo, cyr wheel artist and spectacular musical fireworks display by World Fireworks Champions Blitz Fireworks that included songs by Coldplay and the Chainsmokers, Oasis and Classic Opera Song 'Time to Say Goodbye'. The night's entertainment also included music by the Marc Kenny Band, a DJ set by Danny Bee, Pic & Pose photo booth, a raffle and an auction. The evening’s dishes were sumptuous, with a three course meal served by D’vine Catering, cupcakes by Amelia and cocktails and flair bar tending by Flair ‘N’ Funk. The Raffle was a huge success with a grand assortment of great prizes. But the auction was the main highlight of the evening, with key items for sale such as Oasis signed guitar by all the band members, Pangea Silver Glitter Elephant, Jaguar and Horse statues that were imported from Namibia, Football & Rugby Packages that included signed shirts and signed boots with tickets to matches, ladies’ diamond earrings and a day of racing with the Stig. Chantelle Drewery who organises the annual event commented, "The atmosphere was incredible on this night. This year was bigger and better than ever before. We can’t thank you all enough for the huge amount of money we have raised to everyone who donated during our fantastic raffle and those of you who really dug deep to bid on our amazing auction prizes." The night was organised and run by Chantelle Drewery of Having a Ball Events, who worked closely with Mr Trevalyan, Lisa Marriott and John Latham for months prior to the scheduled date. Having a Ball is a Southport-based Events Company, specialising in the organising and running of events and mobile bars.